So I woke up looked outside, and guess what? MORE SNOW. Usually I don’t complain about the weather but I’m a little over the snow, let’s get on with SPRING! At least it is Easter and that makes it feel like spring and I had my mom’s famous Lasagna to look forward to later. Earlier in the week my mom called and asked us to come over for a family get together on Easter, we were in ofcourse. Then she said “are you guys interested in eating meat?” sounds funny right? But here’s the thing we (Billy and I) don’t eat much meat at our house, just a personal choice. The cool thing for us is that when we do decide to partake in meat it’s usually something special like Thanksgiving turkey or my mom’s famous Lasagna, and it didn’t disappoint. Thanks mom and big Mike for a great get together and mom your Lasagna is amazing, so worth abandoning my veggie ways for a classic homemade dish of love. P.S. I made an Asparagus dish to take to my mom’s, here’s the recipe ENJOY. 2. In a medium mixing bowl combine the rest of the ingredients. 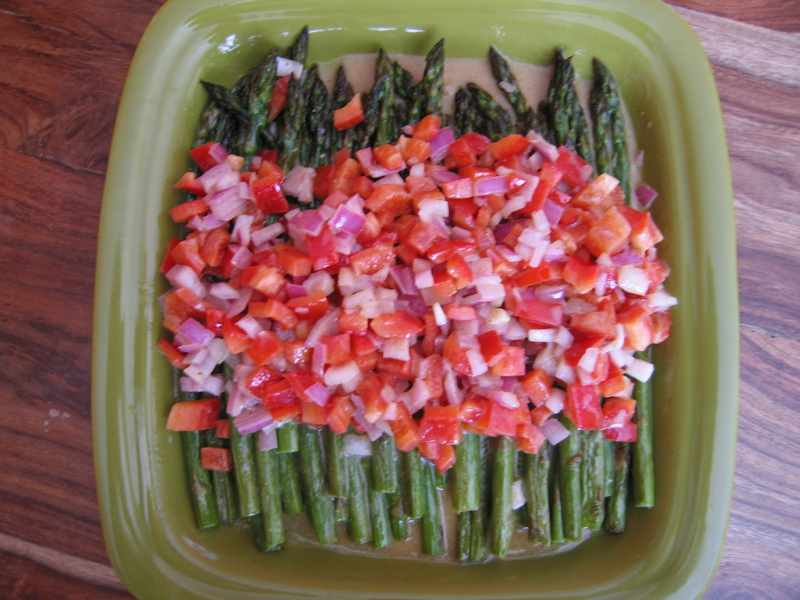 When asparagus is ready lay them in a shallow dish and drape with the mixture in the bowl. *This dish came from one of my long time clients Mary Strickland, thanxMary.